The Norse-Gaels (also known under the terms ‘Hiberno-Norse’ or ‘foreign Gaels’) were a people who originated in the Norse settlements established during the Viking Age in Ireland, Scotland, Isle of Man, and the Hebrides who resulted from the intermarriage between the Norse colonists and the indigenous Gaelic populations. The Norse-Gaels became the dominant force on the territories around the Irish Sea between the Early Middle Ages to the High Middle Ages, founding powerful kingdoms in the process, most notably those of Dublin, Mann and the Isles (i.e. the Isle of Man and the adjacent islands), and Galloway in south-west Scotland. In early medieval Ireland, the Norse-Gaels primarily descended from the regions settled mostly by the Norwegian Vikings between the 8th and 10th centuries. The first recorded Viking raid in the Irish Sea took place in 795 on Lombay Island. Other two noteworthy raids took place on Irish soil unfolded on the coastlines of the petty kingdom of Brega (located north of contemporary Dublin) in 798 and of Connacht, one of the four historical provinces of Ireland, in 807. These early Viking raids were based on quick hit-and-run tactics and may have been entirely conducted by Norwegian Vikings. Subsequently, the main regions of Norse settlement were established in Dublin, Wexford, Waterford, Limerick, and Cork. These cities were initially built as coastal defensive strongholds (known as ‘longphorts’) by the Norsemen during the first wave of settlement in the Emerald Isle (which corresponds to the Irish Early Middle Ages). With respect to Scotland, the earliest Norse incursions can be chronologically traced down to the early 8th century. As in the case of Ireland, the vast majority of Vikings who raided and then settled were Norwegian in origin. In the wake of the first Norse-Gaelic contacts, the archipelagos of Shetland and Orkney were named ‘Norðreyjar’ (i.e. ‘the northern isles’ in Old Norse) while the Hebrides, the islands of the Firth of Clyde and Isle of Man — that formed the basis for the Kingdom of Mann and the Isles — were named ‘Suðreyjar’ (i.e. ‘the southern isles’ in Old Norse). The Norse-Gaels exerted tremendous influence and power over the Kingdom of the Isles from the 9th century to the 13th century. Furthermore, the greatest legacy of the Norse settlement of Man is that they introduced land divisions and the Tynwald parliament which are still in use. Tynwald, along with its Faroese and Icelandic counterparts, are the most oldest functional parliaments to contemporary times. As in other places where they settled, the Norsemen assimilated in the local Gaelic cultures, speaking the Gaelic language and practicing the Gaelic customs. In addition, they did also provide a cultural syncretism, combing Scandinavian and Gaelic cultures, thus creating a strong historical legacy. 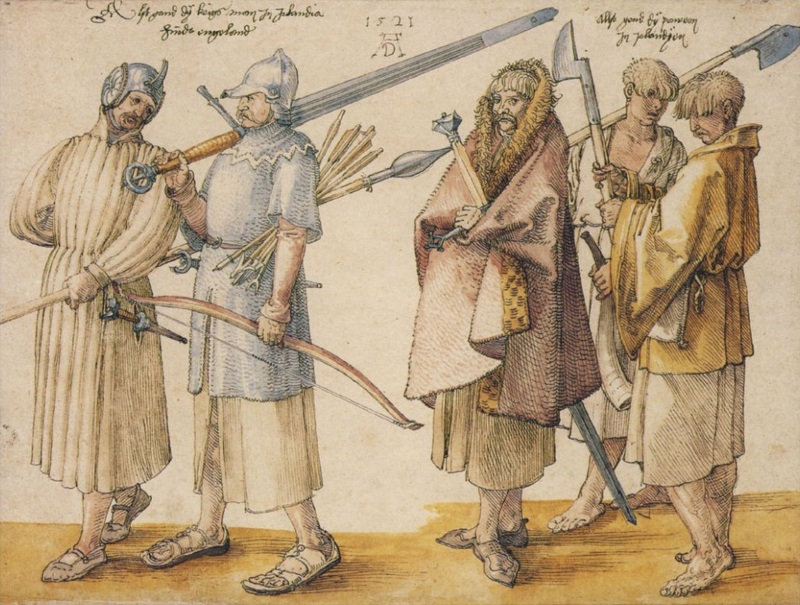 The Norse-Gaels called themselves ‘Ostmen’, literally meaning ‘men of the east’, as opposed to ‘Vestmenn’, meaning the Gaels or literally ‘men of the west’. Their name is preserved in some localities in Iceland and the Faroes, namely Vestmannaeyjar (i.e. ‘Westmen Islands’) and Vestmanna (i.e. ‘Westman’s Harbour’). The problem is that the people of the British isles (and other areas throughout Europe and the Middle East) could not distinguish between raiders and traders from the three Scandinavian regions, thus calling them alll “danii”, or “vikings”, etc. “Norse” is the best contemporary collective term that we have for these Swedish, Norwegian, and Danish raiders and traders. They often didn’t distinguish much themselves, or identified themselves as members of smaller regional units such as Scanians from the southeast of Denmark. They often called their language “Danish” which was the same as “Norse” which meant “northern” in the sense of “Scandinavian”. I thought that the Vikings were raiders that came for the spoils. The Danes were traders that established trading towns and laws. I would like to know why Scandinavians were all referred to as Danes? My guess would be that Denmark was a known kingdom that existed in the region in the these times. “Norse” however, means north and would have likely been a collective term that they would use to refer to themselves. Am I right? culture can trace many clear Norwegian characteristics in tradition, language and culture. For eks. the Gaelic spoken in the Hebredies today has retained an old Norwegian pronunciation. Norwegian was spoken in these area up to the 16 th. century. west and mountain ranges that separated large areas. THere is moderne research that shows that the west coast of <Norway and Scotland had sea contact long before the Viking age. Norse and Danes were interchangeable terms for “Scandinavian raiders / traders”. And a) Fin-Gail / b) Dub-Gail may have referred to Scandinavians from a) North Northern Ui Neill and b) Southern Ui Neill (Dublin) not to Danes and Norwegians, as there were no such (modern day national) distinctions in the minds of people at the time. Norse and Danes were interchangeable terms for “Scandinavian” raiders / traders at the time, and a) Fin-Gail / b) Dub-Gail may have referred to “Scandinavians” fighting on opposite sites with a) Áed Findliath in Northern Ui Neill and with b) Amlaíb Conung (Olaf Hviti) and Imar (Ivar Beinlausi) in Dublin. Modern Nations and distinctions along National lines were not present at the time. Any more detail on the Sheephaven / Lough Swilly links with the Norse? To make matters even more complicated, there was no clear political division between Denmark, Norway, and Sweden, even in later Medieval times; Danish kings often ruled the southerly parts of what came to be Norway, as well as Skane in southern Sweden. The links between the ethnic Danes and Ireland were in fact far stronger than this article suggests– the historical Hamlet (Umlave or Olaf) served as the Norse regent in Dublin before his ill-fated return to Denmark. That said, I’m guessing that a lot of any sense of confusion on the issue is largely a result of modern history books, which are often infused with political boundaries due to conflict and the reinforcement of national identity. That is to say it is possible that the cultural lines were a bit more blurred for this region, as well. There doesn’t seem to be much evidence supporting Norse invasion or “intrusion” in this area but, rather, assimilation and adaptation. Peaceful marriage. My family left Stavanger, for America, with the surname Herod, which is evidently more closely associated with the Dal Riata than it is with any locale in Scandinavia. However, they identified as Norwegian people and changed it something more Norkish.